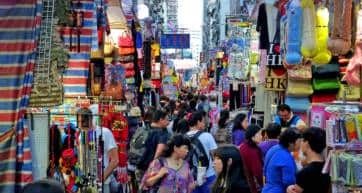 It’s all about markets in Mong Kok—clothes, souvenirs, birds, flowers, even sneakers—each in its own district, focusing on a specific good or commodity. 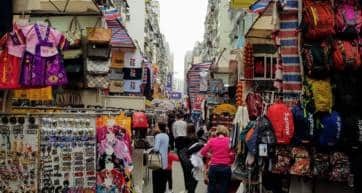 You could spend half a day or so exploring the markets by foot, starting from the Ladies Market, which is close to Mong Kok MTR Station, and heading north to finish at a quaint Bird Market, close to Prince Edward MTR Station. There’s lots to see and explore in between these two landmarks, so read on to learn about the highlights. Ladies Market is the biggest and most popular one in the area, and even if you don’t like shopping it’s a really interesting experience just walking through it. The shopkeepers at this open air street market don’t start setting up the stalls until later in the day, so don’t bother going in the morning. From 4pm it’s a pedestrian zone, and by night time a bustling, bright, crowded area with lots to see. Next up is the Goldfish Market, where you probably won’t buy anything, but it’s cool to walk around and see the hundreds of bags of brightly coloured fish hanging up for sale. Goldfish are considered auspicious in Chinese culture, but the market sells a lot more than just goldfish, including reptiles, such as turtles. Around the corner is the Flower Market, where the entire street is in full bloom. The wholesalers around here sell the freshest flowers year round, but around Chinese New Year it is particularly vibrant and busy. Next to the Flower Market is the Yuen Po Street Bird Garden, where every day old gents take their birds for a ‘walk’ in beautiful handmade wood cages. You’ll also notice the bags and cages of crickets and grasshoppers, which they feed to the birds with chopsticks. After the Bird Garden, it’s an easy walk to Prince Edward MTR Station, to continue with your sightseeing. If you haven’t tried Hong Kong–style street food yet, Mong Kok is the perfect place to do it. Food stands are on almost every corner selling quintessential Hong Kong snacks and drinks, such as cane juice. 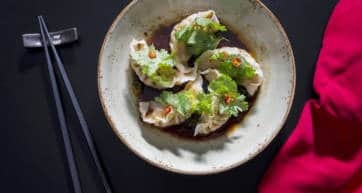 You’ll no doubt smell the sweetness of egg waffles, the pungent punch of stinky tofu, and the spiciness of curry fish balls, all wafting through the air. If bubbling pots of meat stew or pig intestines on a stick isn’t your cup of tea, then try out sweet treats like pineapple buns (spoiler alert: does not contain pineapple) and Portuguese egg tarts, or ‘siu mai’ dumplings. 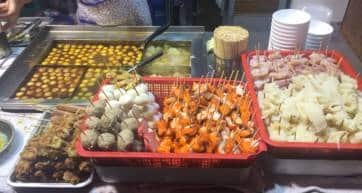 You can easily wander around the lanes behind Ladies Market (Tung Choi Street) looking for somewhere local to eat, and you certainly have a lot of choices. Hay Wong has a picture menu showing which delicious dim sum they serve, which makes ordering a lot easier. A popular Japanese restaurant is Lo Ku Ma Ru, with fresh sashimi and a wide variety of sushi. And Little Fusion is a local eatery offering Hong Kong-style Italian food at very good prices. When evening comes, if you’re feeling for Western fare and some live music, hit up The Live House which has a great atmosphere, pasta and steak dishes, and local bands playing all night. One particular bar in Mong Kok proves that you don’t have to be on the waterfront to have awesome views. The Garage Bar at the Cordis Hotel has a funky red and black motif, a huge open-air terrace, and a wide range of craft brews on tap. When you stay in Mong Kok, you’re really in the thick of it, and you can expect lots of crowds and noise as soon as you step out of the hotel. 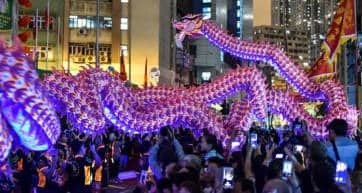 There’s a high concentration of hotels along Nathan Road, and a number of hostels offering budget options such as dormitories, if you’re on a tight budget. About a 10-minute walk from the Mong Kok MTR Station is the popular Metropark Hotel, which has a fitness centre, a coffee shop, and a bar. Stanford Hotel is also very well located and walking distance to all the attractions, with clean, spacious rooms. The Hilton Garden Inn has bigger than average rooms, as well as a lovely outdoor swimming pool, which is a welcome respite from the notorious Hong Kong heat. Hong Kong Cheapo is the site of choice for value hunters who want their $$ to go further in Hong Kong. Some of the articles on this site contain affiliate links. If you purchase from or sign up with some companies we link to, we will be compensated. We don’t endorse any of the companies we link to but we are selective in terms of the companies that we choose. You should exercise careful judgement with any online purchase. Sponsored posts are clearly labeled with a “Sponsored” tag. Additionally, content such as tours and tickets, hotels and apartments are commercial content.